Never been to an opera? Think you won’t like it? Ever wondered what makes Opera so special – or even what it is? Well nows your chance to find out! 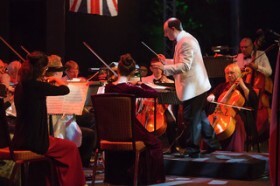 With the fantastic British Philharmonic Concert Orchestra led by conductor Tony Kraus, for A beginners guide to the Opera, presented by Artistic Director of Charles Court Opera, John Savournin, leading the way with a funny, informative, interactive and entertaining narration. This light-hearted, sparky concert promises to offer a chance for opera-virgins to dip their toe in the water and find out what’s it all about without getting cold feet, with a programme that is full of operatic favourites, sung with a flush full orchestra, bringing music to the seasoned and unseasoned opera goers’ ears. Put on your glad rags, brush off the stuffy conventions and give Opera a try.